In order to elicit change, you have to make your voice heard. In the era of President Donald Trump, this is easier said than done for some communities. On Tuesday Oct. 1, dozens of student organizations came together to host “#NPWakesUp,” a walkout and rally peacefully protesting the separation of families at our country’s borders, as well as the injustices faced by students of color on our own campus. Tejada is the president of the Latin American Student Union, one of the many organizations whose members attended the rally. The turnout was great, with many students leaving classes to participate. 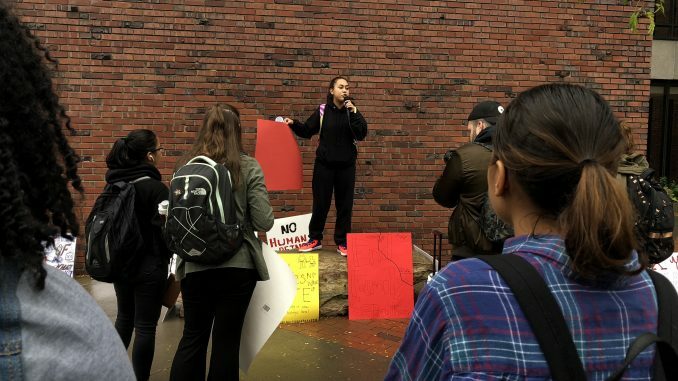 “I made the decision to go to this rally because after a period of nothing changing in the school it seemed that the only way to get a response was to go directly to the higher administration and voice our opinion,” said second-year computer science major Alexandra Maceda. The night before the rally, students came together to make posters that would be displayed during the rally. The events began outside of the Humanities building, with students giving inspiring speeches on why action must be taken. The rally was met with negative responses from some students. The peaceful protest itself was an extremely powerful event. A large group of students and faculty gathered to make their voices heard, marching into humanities, through the halls, then across campus to the Hasbrouck plaza, where the march ended. “I am unbelievably proud of my campus community for coming together like we did,” said said fourth-year digital media production major Rey Anthony Gonzalez, who was in attendance at the rally. In the end, the rally turned out to be a major success, with a formal apology being received from Gerald Benjamin and the athletic department agreeing to host a forum to discuss the events of this summer and address any other concerns. The board of trustees will hold a meeting to make a decision on the names of the Hasbrouck complex on Nov. 1. Tejada expects to see a similar turnout at this important forum. “I can confidently say that after our rally, there will be a huge attendance of students at that meeting in November to show support for the name change, and help influence the decision of the Board of Trustees,” Tejada said.